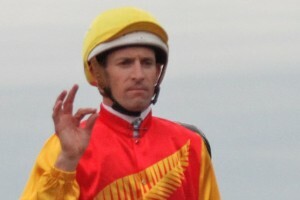 Unbeaten colt Jonker has pleased Hugh Bowman after the champion jockey put the equal favourite through his final paces for Saturday’s $2m Magic Millions 2yo Classic (1200m) at the Gold Coast. Hugh Bowman, above, is pleased with the preparation of Jonker heading into the 2018 Magic Millions 2yo Classic at the Gold Coast. Photo by Daniel Costello. Bowman teamed up with the David Atkins trained Jonker for a Tuesday morning gallop and only had positive thoughts for the Spirit Of Boom colt. “I rode him this morning (Tuesday) and I’m very pleased with how he’s going, I’m looking forward to Saturday,” Bowman told racing.com. “He’s a very natural horse and has got a lovely temperament which is in my opinion just as important as being able to gallop. Jonker also came up trumps at the barrier draw for the Magic Millions 2yo Classic, drawing the number three marble but is likely to jump from two in the final sixteen horse field with the third emergency Spirit’s Pride, who drew the pole position, unlikely to gain a start. Bowman was very positive about the inside gate and indictaed that he would like to settle Jonker just behind the leaders. “I’m very pleased with [barrier three], a good draw is important particularly here at the Gold Coast and any big race really over a short course,” said Bowman. Bowman takes over from Aaron Bullock who has been aboard Jonker for his two unbeaten starts in the $50,000 Max Lees Classic (900m) at Newcastle on December 3 and in the $200,000 Wyong Magic Millions 2yo Classic (1100m) at Wyong on December 21. “I’ve watched the replay of his Wyong win and I thought he ran around a little bit there and I’d like to think that he wouldn’t do that next time out,’ Bowman said. Jonker was temporarily elevated to be the $4.20 favourite at Ladbrokes.com.au following Tuesday’s barrier draw for the Magic Millions 2yo Classic but on Wednesday morning shares the top spot in the market order at $4.40 with the Tony McEvoy trained Sunlight. Sunlight drew barrier fifteen in the original draw but will come into twelve if all the five emergencies fail to gain a start while the next in the betting at $4.80, the undefeated Ef Troop, looks set to jump from gate thirteen.